Image: Velizar Simeonovski © The Field Museum. Used with permission. The discovery of ancient artifacts and mastodon bones in a submerged sinkhole shows that humans first inhabited the southeastern corner of North America 1,500 years earlier than previously assumed. A collaborative research team has pulled up dozens of stone tools and the remains of extinct animals from the Page-Ladson site in Florida, a 26-foot-deep sinkhole located in the Aucilla River just outside of Tallahassee. It now represents the oldest known site of human life in the southeastern United States, dating back approximately 14,500 years. It’s also the oldest submerged archaeological site in all the Americas, and one of the oldest sites on continent. 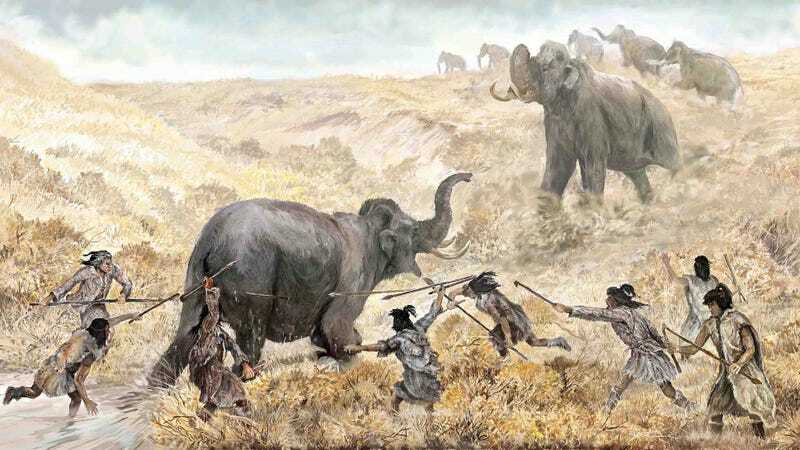 The discovery shows that a population of pre-Clovis hunters—possibly with the assistance of dogs—hunted mastodon in what is now Florida. This research has been published in the latest edition of Science Advances and was conducted by a multidisciplinary team of scientists from Florida State University, Texas A&M University, and the University of Michigan. Clovis hunters originated south of the large ice sheets that covered Canada near the end of the last glacial period. They are the direct descendants of the earliest people who arrived in North America some 15,000 years ago. Numerous sites around the continent date to around 13,000 years ago, but only a small handful in all of North and South America are older. This new discovery shows that a population of pre-Clovis people adapted to the region much earlier than previously assumed. Back in the 1980s and 1990s, the Page-Ladson site was investigated by archaeologists James Dunbar and David Webb, who retrieved several stone tools and a mastodon tusk with cut marks. But their discovery didn’t receive much attention because the finds were considered too old to be credible and because they were found in such an unusual setting. It’s unusual to find artifacts submerged under nearly 30 feet of water, but it does happen. Landscapes can change quite dramatically over long time scales, often obscuring traces of human habitation. This particular settlement was buried under 13 feet of sediment during the late Pleistocene, a condition that also left the site submerged. Eager to give the site another try, Jessi Halligan from FSU and Michael Waters from Texas A&M re-visited the water saturated sink hole between 2012 and 2014. Working in near-zero-visibility waters, they managed to pull up dozens of artifacts, including stone tools and the bones of extinct animals. They even discovered a so-called biface: a knife with sharp edges on both sides that was used for cutting and butchering animals. The researchers also conducted a more thorough investigation of the mastodon skull discovered decades earlier. The skull features obvious signs of cutting, including deep, parallel grooves on the surface of the tusk. So Dunbar and Webb were correct in their assessment: humans were hunting mastodons in Florida nearly 15,000 years ago. Daniel Fisher from the University of Michigan, a co-author of the study, said the tusk was probably removed so that the hunters could gain access to edible tissue at the base. Fisher has firsthand experience doing this himself, as he’s excavated mammoths and mastodons in North America and Siberia. The pulp cavity of each tusk contains about 15 pounds of tender and nutritious meat. Meanwhile, the deliberate nature of the cuts into the side wall of the tusk socket shows the pre-Clovis hunters knew exactly what they were doing and that they had a rudimentary understanding of mastodon physiology. The ivory itself was likely used to forge weapons. “These grooves are clearly the result of human activity and, together with new radiocarbon dates, they indicate that humans were processing a mastodon carcass in what is now the southeastern United States much earlier than was generally accepted,” said Fisher in a statement. This is strong evidence against the so-called “Blitzkrieg” hypothesis, which suggests that early humans hunted mastodons to extinction at a rapid rate. This evidence, along with traces of sporormiella (a type of fungus), shows that humans and “megafauna” coexisted for at least 2,000 years. Many of these large animals, including the mastodon, became extinct around 12,600 years ago. The discovery adds to our growing knowledge of how and when North America was first settled. Data collected by other teams suggests that people were also adapting to living in Texas, Washington, Oregon, Pennsylvania, Wisconsin, and South America around the same time. “Clearly, people were all over the Americas earlier than we thought,” said Halligan.